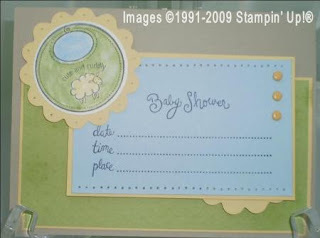 Lily's Ink Pad: Baby Shower...Mojo Style! This sketch is great. Check out the Mojo Monday Sketch Blog for inspiration! Love what you have been doing lately. I think you did well on the Baby invite! Very Cute!! Well, I think this baby shower invitation turned out lovely... you really did a super job on it! That is a great sketch too - lots of possibilities and I love your interpretation for it. Sweet Bags for Special People! It's that springy time of year! WHOOO HOOOOO! An Easter Sneak Peek!